Wear-Patch is a wear, abrasion and corrosion resistant coating consisting of a mixture of 70% ceramic beads suspended in epoxy resin. Wear-Patch provides excellent protection against sliding abrasion and moderate impact when used in bulk handling operations. Wear- Patch can be applied by trowel or spatula and cures under normal conditions in about 8 hours. Wear-Patch S - standard formulation for general wear conditions. Wear-Patch U - ultra hard formulation for most abrasive conditions. 70% concentration of ceramic beads suspended in epoxy resin. Wear-Patch S - major component alumina. Wear-Patch U - major component silicon carbide. Approximately 8 hours at 21°C. 7kg covers 0.75m2 to 6mm thick. Wear-Patch adheres to most clean, dry surfaces including metal, ceramic, plaster, wood and cement. 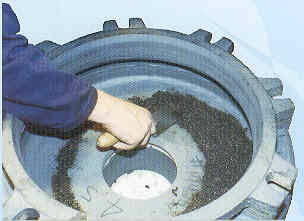 Roughen smooth surface with a steel brush or by sand-blasting. Can be applied in thicknesses from 1.5mm to 25mm with little or no sagging or slumping. On large areas, welded anchors or tack welded expanded metal are recommended.